1 Preheat oven to 400°. Evenly brush 4 tortillas with 2 tablespoons Hellmann's® or Best Foods® Real Mayonnaise. On cookie sheet, arrange tortillas, Mayonnaise-side-down; set aside. 2 In medium bowl, combine tuna, 1/4 cup Mayonnaise, lemon juice and onion. 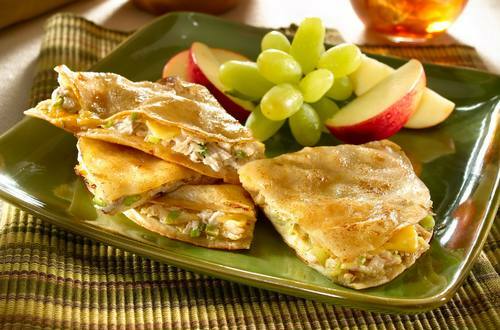 Evenly spread tuna mixture on tortillas, top with cheese, then remaining tortillas. Evenly brush tops of tortillas with remaining 2 tablespoons Mayonnaise. 3 Bake 10 minutes or until cheese is melted and tortillas are golden. Cut into wedges and serve immediately.